All transactions are safe and secure with a reliable history in online purchasing behind each of our associates. 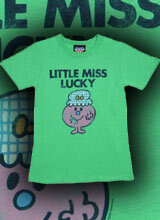 Buy the Little Miss Lucky t-shirt to own Little Miss clothing and merchandise. Bad dreams don't just happen in the real world, they happen to story book characters like Little Miss Lucky too. After snuggling into bed with a nice book, she is drawn from her covers to a noise at the front door. When she gets to the door, she goes outside only to be locked out and swept away by the wind. She is carried away to a haystack where a tree begins to chase her. Luckily for her, she wakes up to realize it was only a dream. Imagination is a wonderful thing to have, so grab any of our Little Miss shirts, clothing and merchandise to show off some of the fruits of Hargreaves' head. In addition to the Little Miss Lucky tee above, browse the Little Miss Clothing Gallery for more apparel like men's and women's clothes, kids shirts or hoodies.